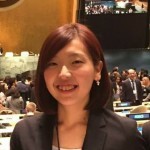 Ms. Tani is passionate about empowering young people in Japan as well to the global society. She is heavily involved in Model United Nations activities in Japan and will be the Secretary General for the first international MUN conference held in Japan, National Model United Nations Japan 2016. Ms. Tani is an alumni from the TOMODACHI MetLife Women’s Leadership Program 2013-2014. Good morning. Thank you for giving me this wonderful opportunity to share my story at this TOMODACHI Summit. My name is Sachiho Tani and I am a junior studying International Relations at Kobe City University of Foreign Studies. Two years ago, I joined in the TOMODACHI when I was a freshman. At that time, I haven’t ever imagined of every achievements I have done ad all the extraordinary people I was able to meet as a participant and as a alumnae. 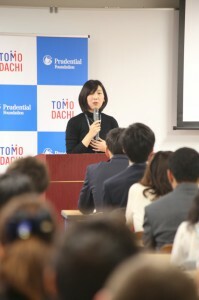 The TOMODACHI MetLife Women’s Leadership Program. This is the program I took part in in 2013. The program provides great networking opportunities for female college students to find good role models and a strong sense of their own leadership styles through workshops and lectures. It also helps them to find their goals by asking these questions, “What do you want to achieve? Who do you want to become? What leader do you envision?” Participants also learn how they can achieve their goals, such as financial literacy and other tools they can apply in their daily lives. In Japan, the word mentorship might still be a new concept. Through this program, we paired up with mid-career female professionals to work together throughout the year as mentor and mentee. We learned from the program, but we also learned a lot from each other. After various workshops and lectures in Japan, we traveled to New York city and Washington, D.C. where the students learned how much women’s involvement means to society. We had the opportunity to meet many female professionals who became great role models as women who really demonstrate what leadership is while making an impact on society. The program taught me the importance of being aware of the differences in society. That was the beginning. This program totally changed my perspective. Before joining this program, I didn’t take any action and passed up opportunities to do something big. I was afraid of taking risks and had the fear that I will get left out if I say something different. But I soon realized this attitude would eventually ruin my life, and my potential. And I thought that would be a waste of my lifetime. Through the program, I made strong bonds of friendship. Even though it has been a year since I took part in the TOMODACHI program, I have continued to be engaged with TOMODACHI and it has brought me countless opportunities. I have attended and spoke at various TOMODACHI activities throughout the year including the U.S.-Japan Council Annual Conference, the TOMODACHI Reception at Ambassador’ Kennedy’s Residence, and to second year MetLife program participants. All of these opportunities gave me other wonderful encounters, not only with professionals I’ve come to respect but also with others in the TOMODACHI Generation. They are all bright and ambitious, eager to make society a better place. It’s very interesting to feel a sense of connection to them, even though we took part in different programs. Our ages may vary, we may have been raised in different regions and under different circumstances but I know, that as the TOMODACHI Generation and I am sure together we can make a difference. I have very important, life-long friends in TOMODACHI. We may live in different regions throughout Japan, but no matter how far we are, we learn from each other, encourage each other and inspire each other. I know I am not alone and that empowers me. I am thankful for these connections. Now, in my college life, I am involved in Model United Nations activities. The purpose of Model UN is to understand international politics through simulation. Participants address complex international problems and develop skills they can apply in the real world through research, public speaking, negotiation skills, leadership and cultural understanding – all of which are integral parts of TOMODACHI. Next year, the Model UN Conference will be held in Kobe, the region I currently call home. And I have been appointed as the Secretary General to lead the steering committee. Participants from over 30 countries, from all different backgrounds will come to Kobe to experience real global society through discussions and interactions conducted only in English. When I was designated to be Secretary General by my professor, it was just before I joined the TOMODACHI program. At the time I was hesitant to accept the offer. As I mentioned earlier, I was afraid of making mistakes or taking risks to do something impactful. However, the TOMODACHI program helped me find my own leadership style and meet many people who inspired me to go the extra mile. They all seemed confident and I aspired to be like them. After coming back from the program, I became motivated to lead the Model UN Conference in Kobe, thinking that this would be an opportunity for me to push my limits. On top of that, I believed that this conference would be a platform to empower future generations of youth, and that the issues I had felt and identified during the program might provide hints to possible solutions for a better society. Now, we have people with ambitions and dreams – we just need the right platform. We need this place to connect and collaborate with each other. TOMODACHI is this place – the place where people with exceptional dreams gather and connect and go back to their own communities with a sense of power and unity. As I, as well as countless other alumni have demonstrated, we – the TOMODACHI Generation – can achieve anything. I encourage you – my fellow tomodachi– to continue to be engaged and to continue to keep in touch. We can empower each other to greater heights. By sharing my story, I hope it shows you how the TOMODACHI experience can accelerate a single person’s potential. Thank you for listening, and thank you for this opportunity.